In young mice, cardiac muscle cells undergo a precisely timed spurt of cell division. This previously unobserved phenomenon contradicts long-held ideas about how the heart grows. Photo: Cardiac muscle from a 15 day old mouse. Red staining indicates the presence of a protein involved in cell division. In similar images from a mouse at day 14 and 16, none of the cells are red. The entire heart muscle in young children may hold untapped potential for regeneration, new research suggests. For decades, scientists believed that after a child's first few days of life, cardiac muscle cells did not divide. Instead, the assumption was that the heart could only grow by having the muscle cells become larger. Cracks were already appearing in that theory. But new findings in mice, published Thursday in Cell, provide a dramatic counterexample -- with implications for the treatment of congenital heart disorders in humans. The burst of cell division is driven by a surge of thyroid hormone, the researchers found. This suggests that thyroid hormone could aid in the treatment of children with congenital heart defects. In fact, doctors have already tested thyroid hormone supplementation in this setting on a small scale. The findings also have broader hints for researchers developing therapies for the heart. Activating the regenerative potential of the muscle cells themselves is a strategy that is an alternative to focusing on the heart's stem cells, says senior author Ahsan Husain, PhD, professor of medicine (cardiology) at Emory University School of Medicine. "It's not as dramatic as in fish or amphibians, but we can show that in young mice, the entire heart is capable of regeneration, not just the stem cells," he says. The Emory researchers collaborated with Robert Graham, MD, executive director of the Victor Change Cardiac Research Institute in Australia. Co-first authors of the paper are Nawazish Naqvi, PhD, assistant professor of medicine at Emory and Ming Li, PhD, at Victor Chang. The researchers tested how much mice, at the age of day 15, can recover from the blockage of a coronary artery. Consistent with previous research, newborn (day 2) mice showed a high level of repair after such an injury, but at day 21, they did not. The day 15 mice recovered more than the day 21 mice, indicating that some repair is still possible at day 15. The discovery came unexpectedly during the course of Naqvi and Husain's investigation of the role of the gene c-kit – an important marker for stem cells -- in cardiac muscle growth. Adult mice with a disabled c-kit gene in the heart have more cardiac muscle cells. The researchers wanted to know: when does this difference appear? "We started counting the cardiomyocyte cell numbers from birth until puberty," Naqvi says. "It was a fascinating thing, to see the numbers increasing so sharply on one day." It turns out that c-kit-deficient and wild-type mice both have a spurt of proliferation; the differences between them appear later. "Probably, previous investigators did not see this burst of growth because they were not looking for it," Husain says. "It occurs during a very limited time period." Even if in humans, the proliferation of cardiac muscle cells does not take place in such a tight time period as it does in mice, the finding is still relevant for human medicine, he says. "Cardiomyocyte proliferation is happening long after the immediate postnatal period," Husain says. "And cells that were once thought incapable of dividing are the ones doing it." Naqvi and Husain plan to continue to investigate the relationships between thyroid hormone, nutrition during early life, and cardiac muscle growth. The research was supported by the National Heart Lung and Blood Institute (HL079040), the American Heart Association, and the John and Mary Brock Diagnostic and Discovery Fund. Reference: N. Naqvi et al. 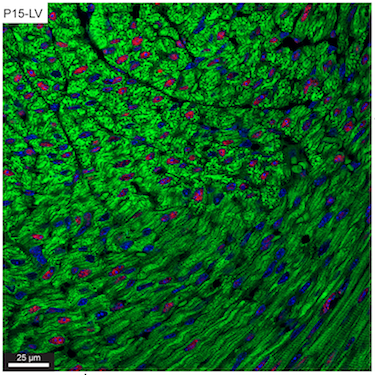 A Proliferative Burst during Preadolescence Establishes the Final Cardiomyocyte Number. Cell 157, 795-807, 2014.